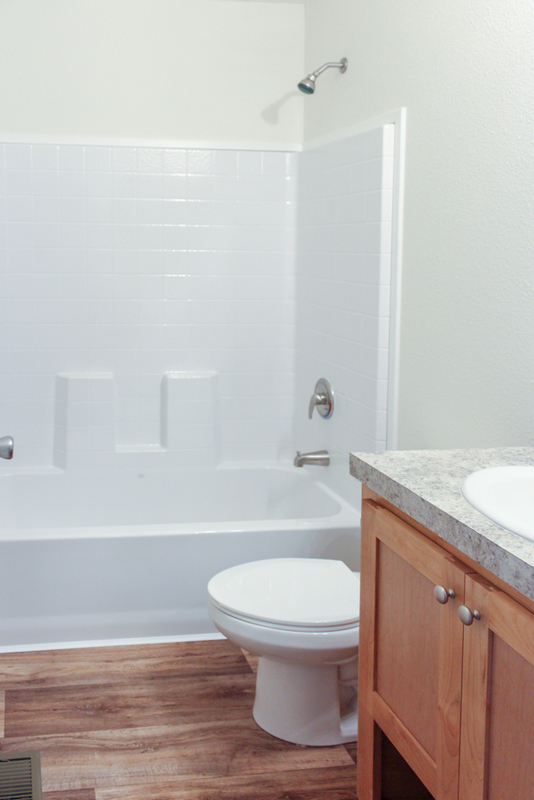 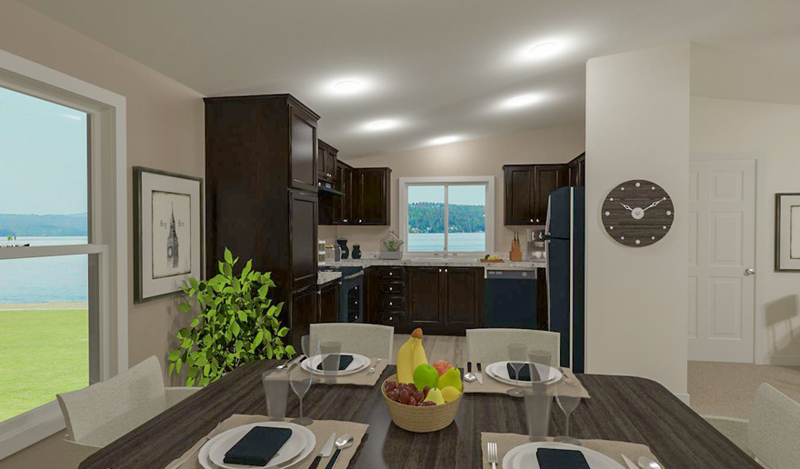 The Oakridge model has 2 Beds and 2 Baths. 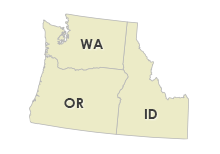 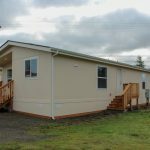 This 1074 square foot Double Wide home is available for delivery in Washington, Oregon, Idaho. 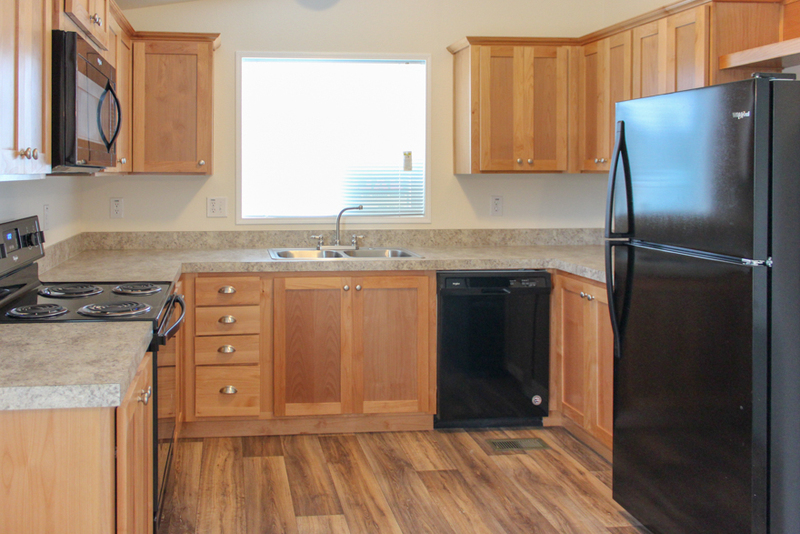 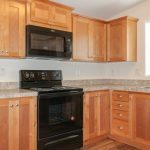 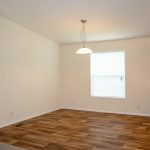 This isn’t your typical manufactured home! 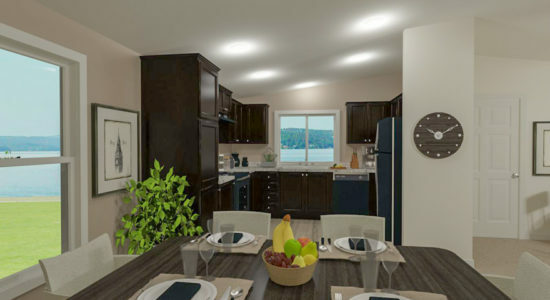 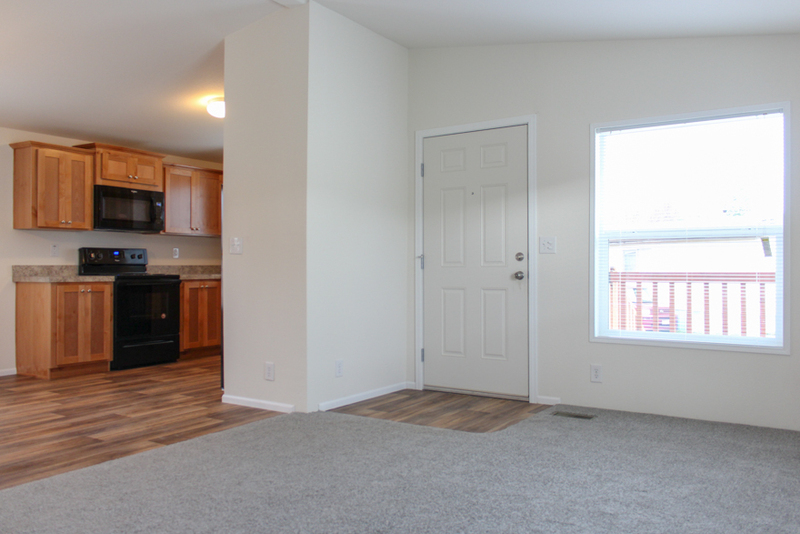 One look at the Oakridge floor plan and you know you’re witnessing something special. 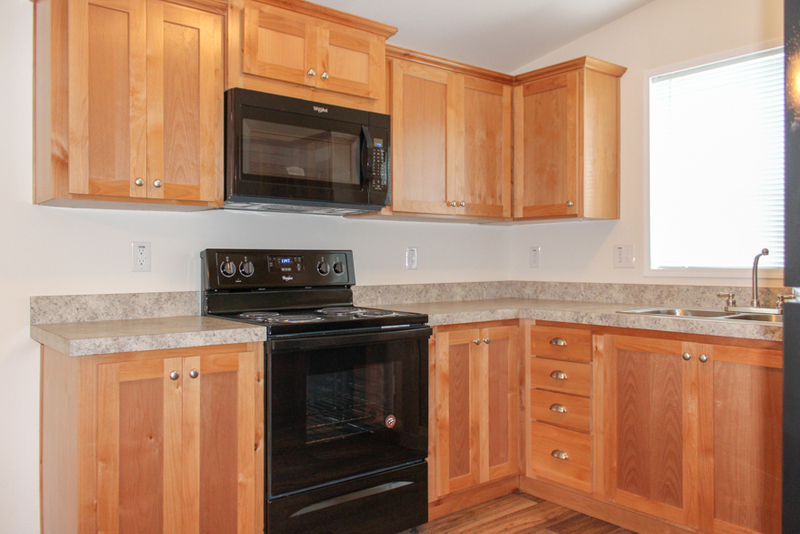 Every well-appointed room and feature in this house has something fabulous to offer. 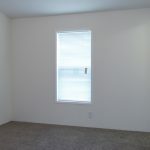 For instance, ponder over the unusual offset ‘end wall’ porch entry. 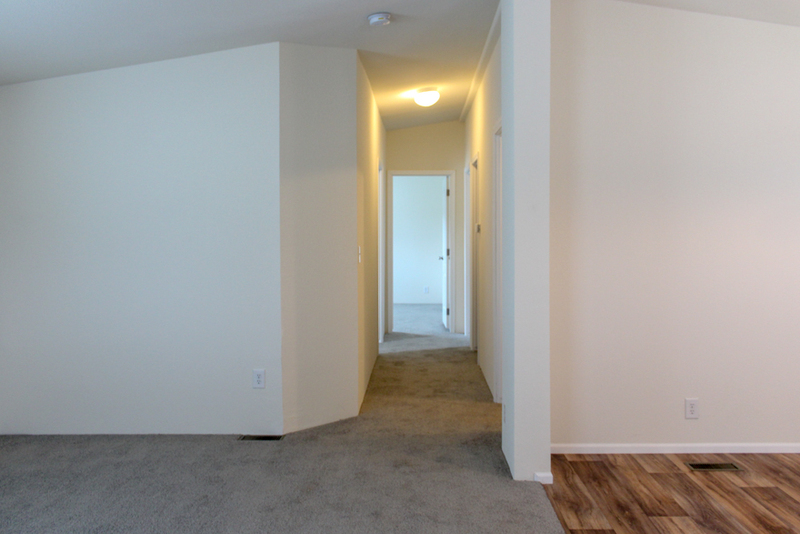 Additionally, the conveniently long hallway separates the noisy common area from the more peaceful bedrooms. 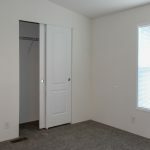 Don’t forget to ask about the optional third bedroom. 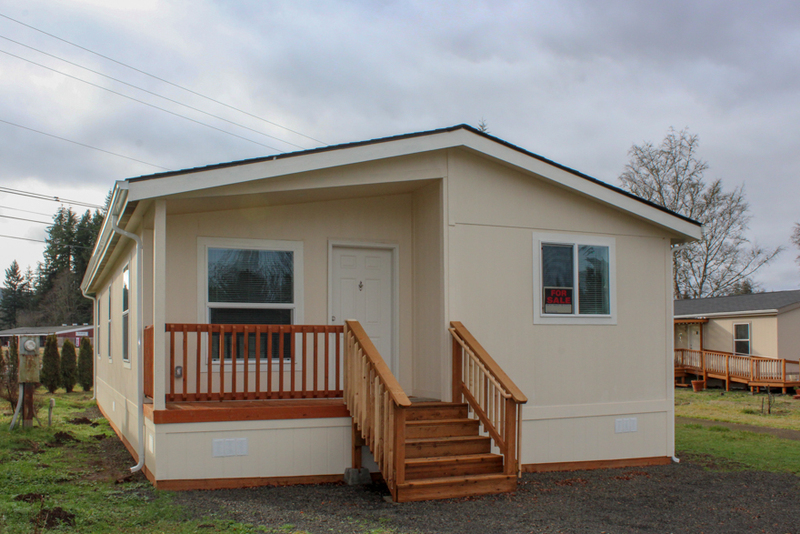 The Oakridge includes a standard 4′ Half Porch with the front door on the end of the home. 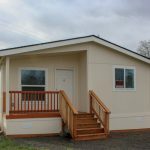 This home includes 12″ eaves on all sides, fiber cement exterior siding, dual pane low-e vinyl windows, and architectural shingles. 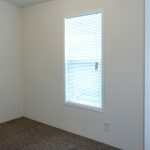 This home is painted Lotus Pod for body and Westhighland White for the trim. 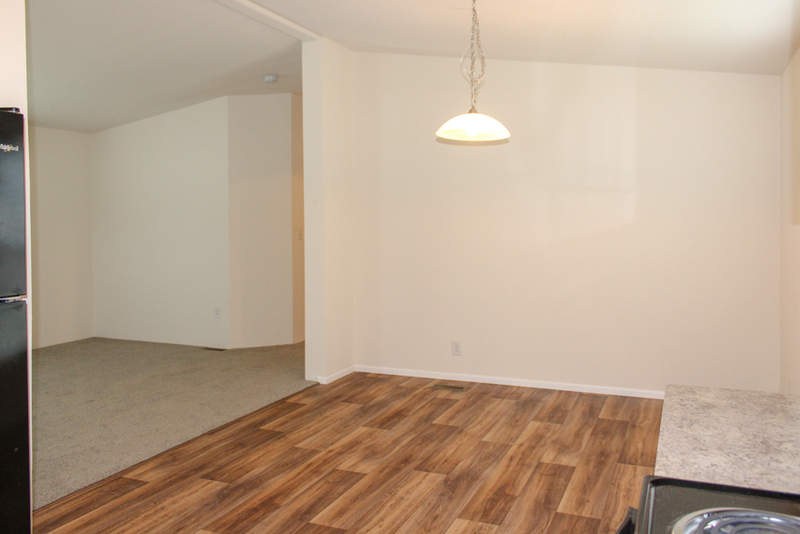 This home features vaulted ceiling throughout the home. 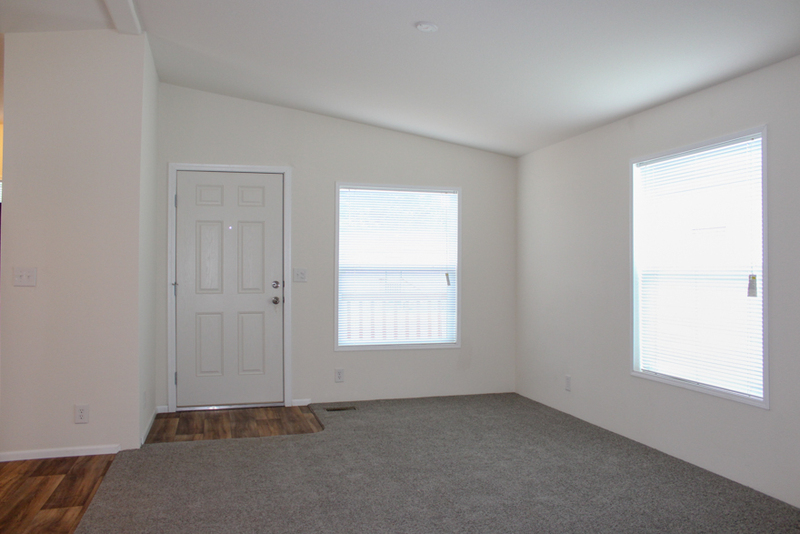 The living room is painted creamy white, the carpet color is Mantra – Rock Ridge, and the entry linoleum is Lime Oak. 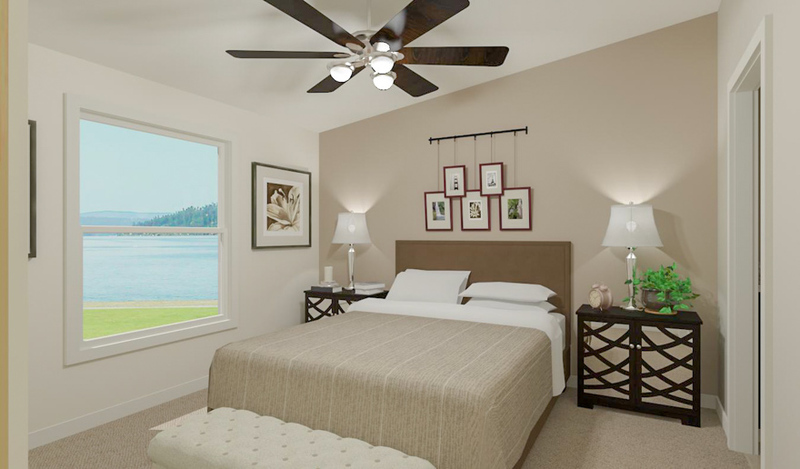 Mini blinds on the windows and the preparation for ceiling fan is an option in this model. 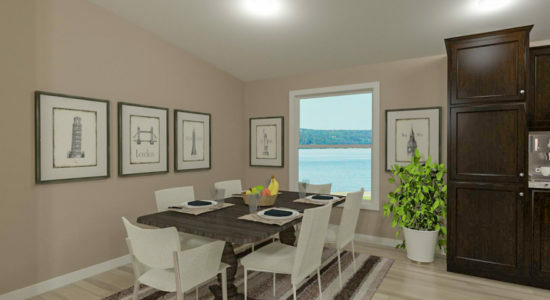 The dining room is open to the living room and kitchen. 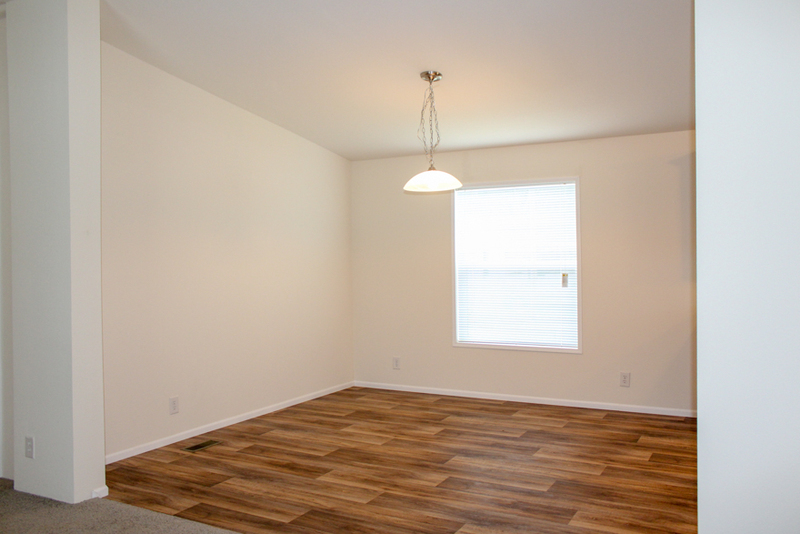 The flooring color is Lime Oak and the interior wall color is Creamy White. 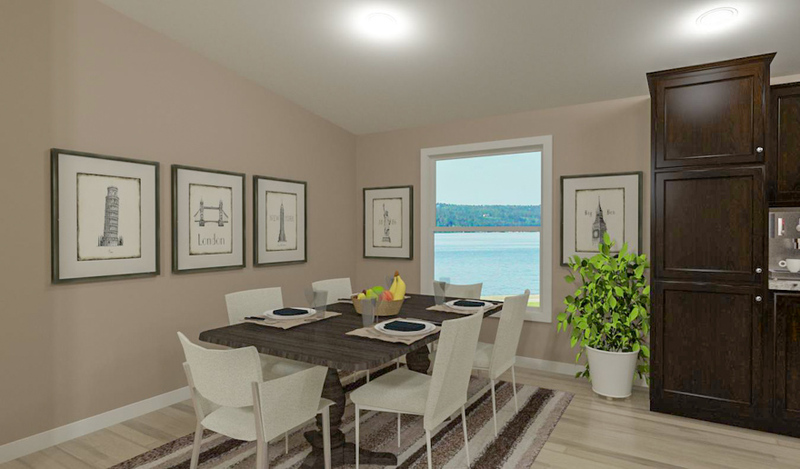 The dining room includes a standard chandelier and there is a lot of room for a good size dining room table. 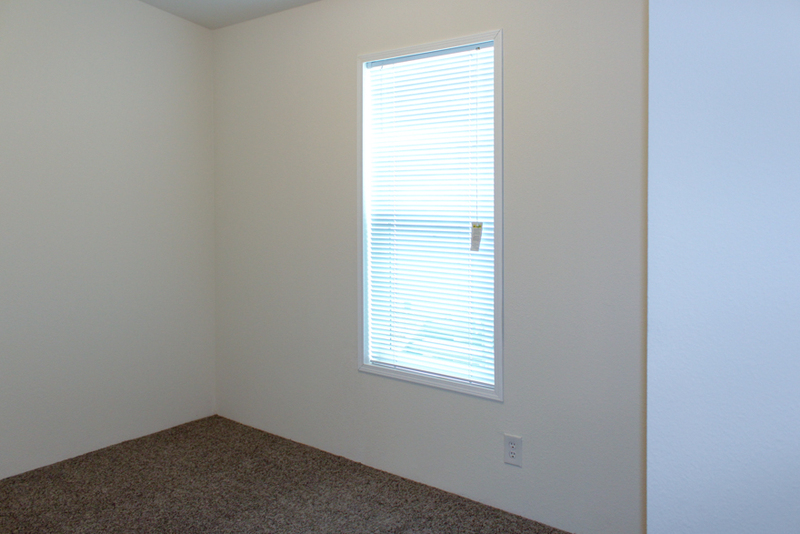 2-1/4″ baseboard molding is included in all linoleum areas and is optional in carpet areas. 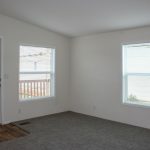 The mini blinds on the window are optional. 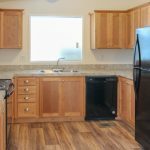 The kitchen is showing the upgrade shaker alder cabinets, an optional dishwasher and microwave, and the mini blind is optional. 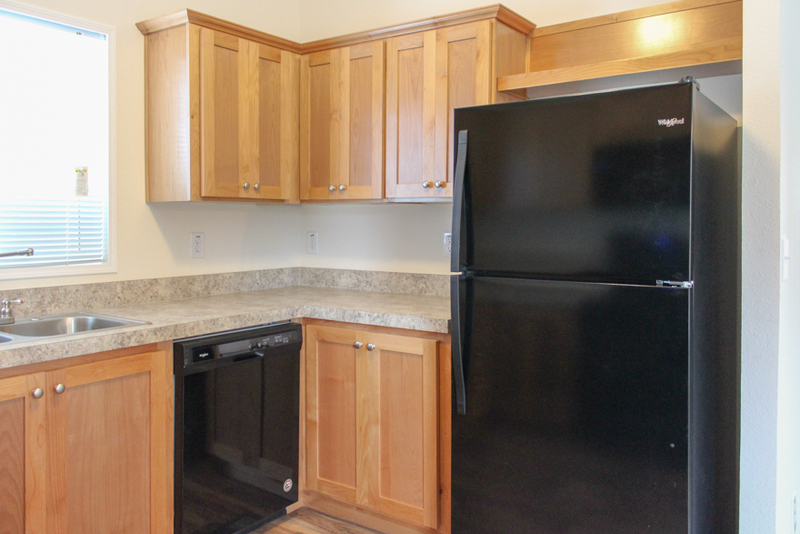 The Whirlpool refrigerator and elecric range are standard. 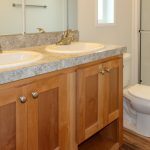 The flooring color is Lime Oak, the paint color on the wall is Creamy White, and the countertop and backsplash color is Belmonte Granite. 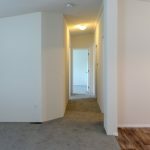 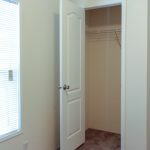 All the bedrooms, the utility room, and guest bathroom are down the hallway. 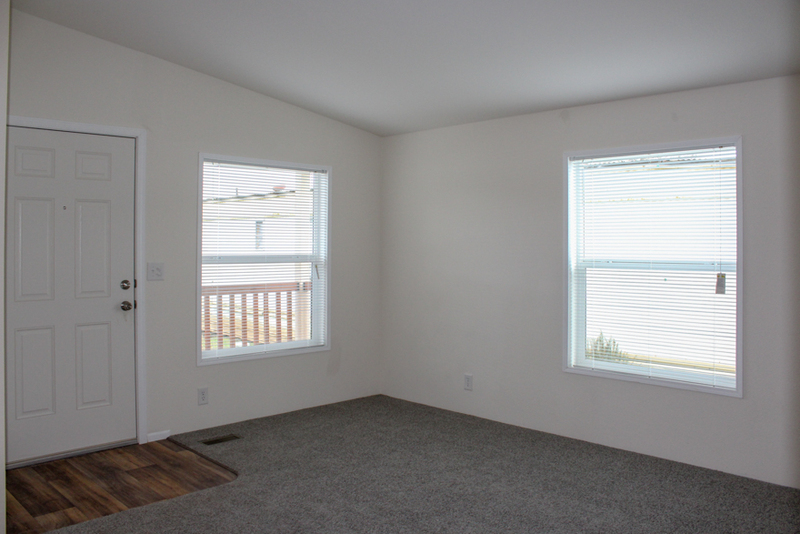 This home is built with the optional 3rd bedroom (in place of the standard den). 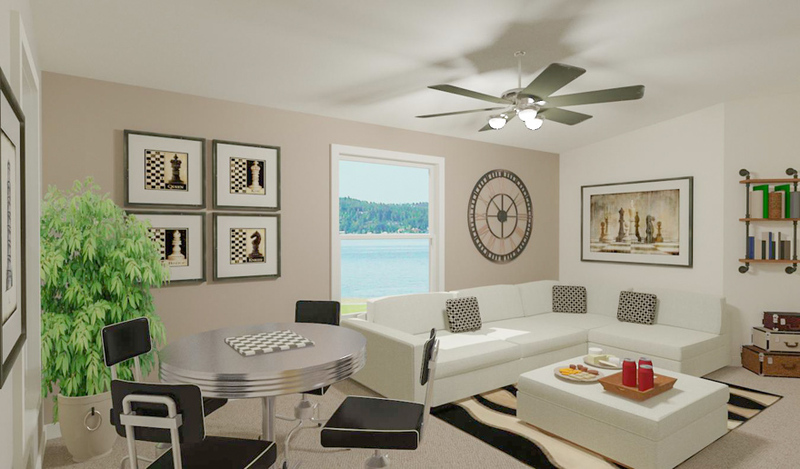 The carpet color is Mantra-Rock Ridge and the interior walls are painted Creamy White. 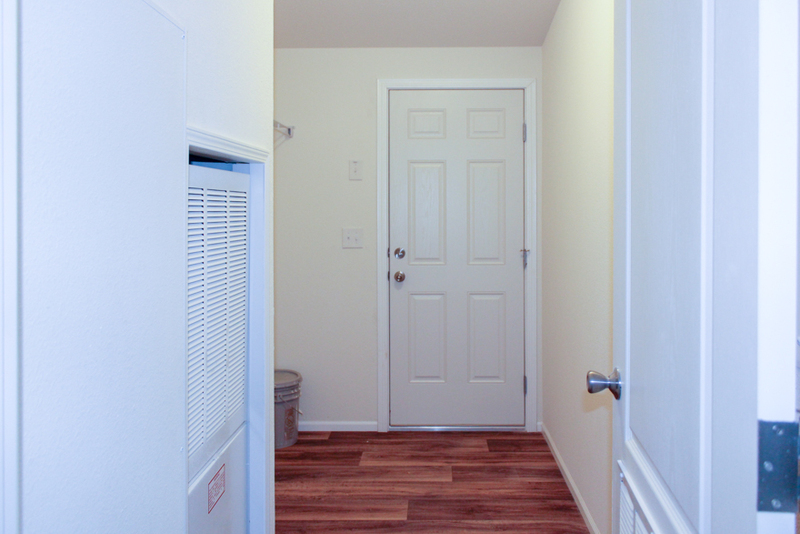 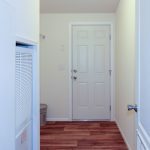 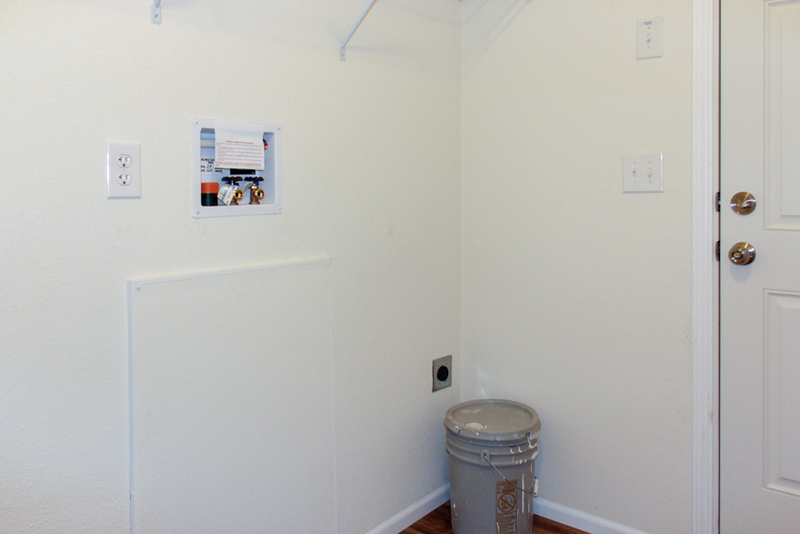 The utility room is located off the hallway and this is where the rear door is located. 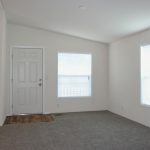 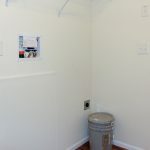 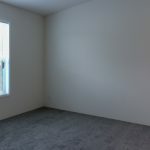 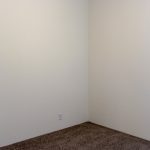 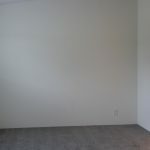 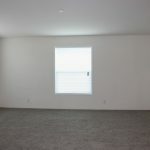 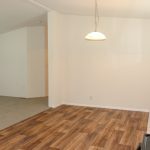 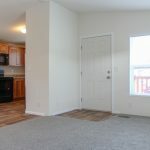 The utility room includes the hookups for a washer and dryer and the furnace and water heater are located in this room. 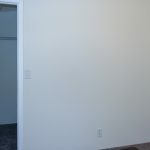 The flooing is Lime Oak and the walls are painted Creamy White. 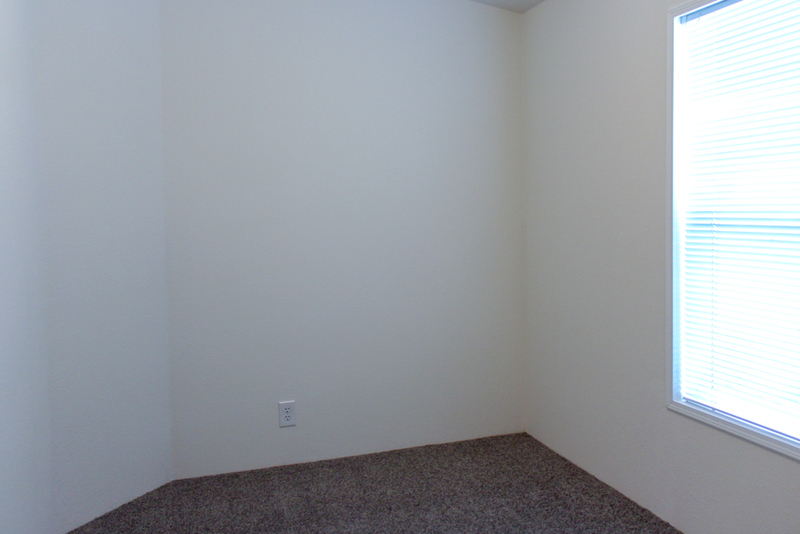 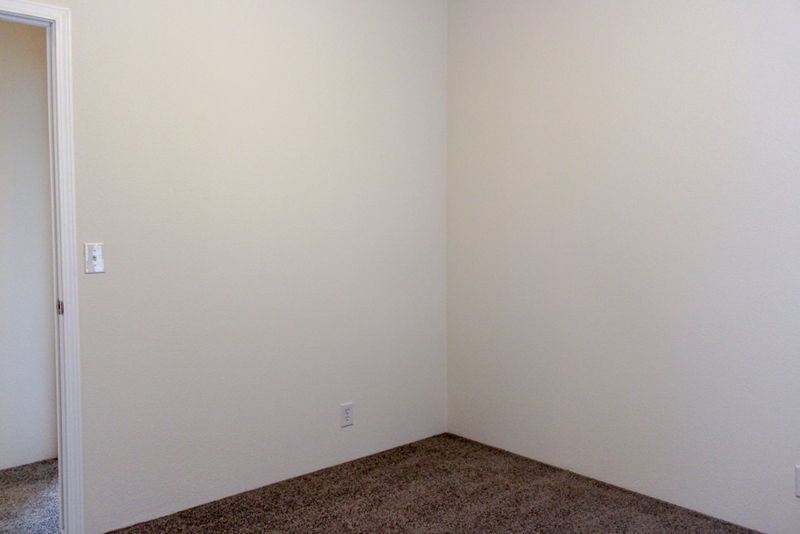 This is the optional 3rd bedoom, in place of the standard den. 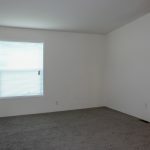 The bedroom is showing Mantra-Rock Ridge carpet and Creamy White walls. 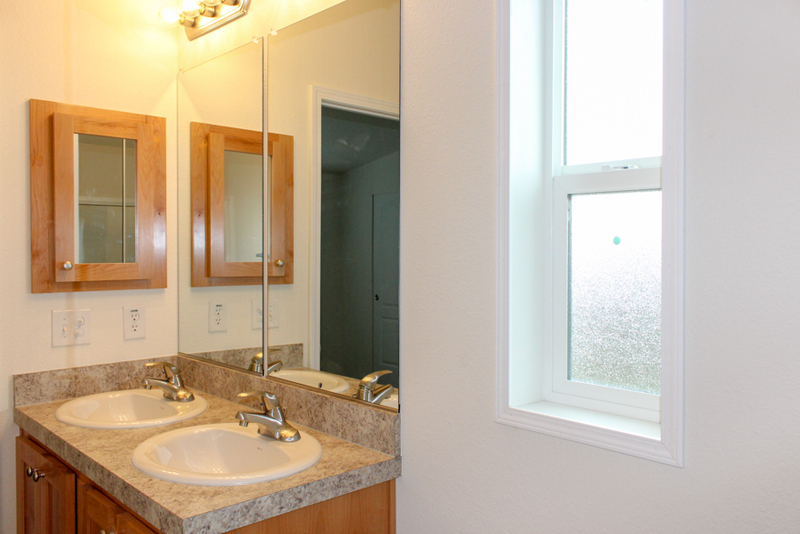 The mini blind is optional. 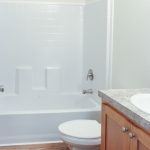 The guest bathroom is showing the Easy Upgrade Guest Bathroom Package – which includes a one-piece fiberglass tub/shower, elongated toilet, china sink, single lever faucet, and mirrored medicine cabinet. 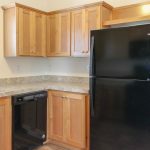 The flooring color is Lime Oak, the walls are painted Creamy White, and countertop color is Belmonte Granite, and the cabinet is the upgrade Shaker Alder. 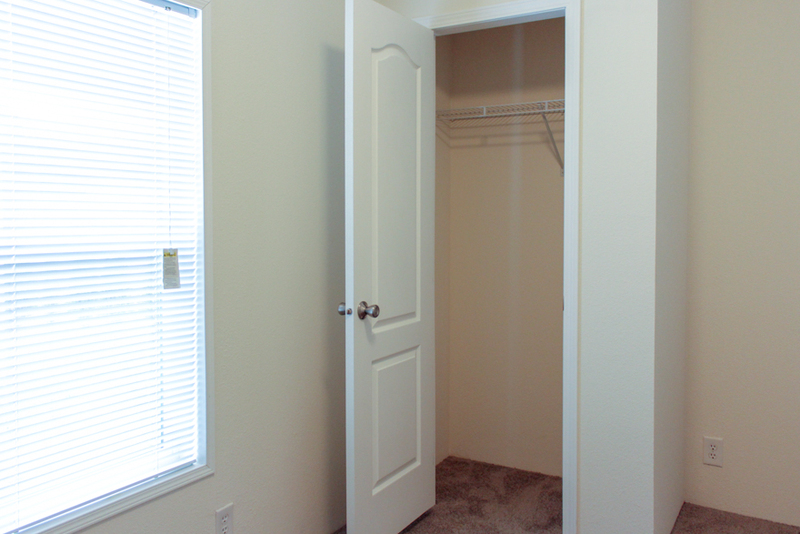 Bedroom #2 includes a walk in closet. 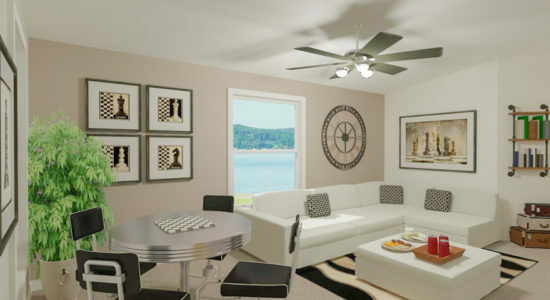 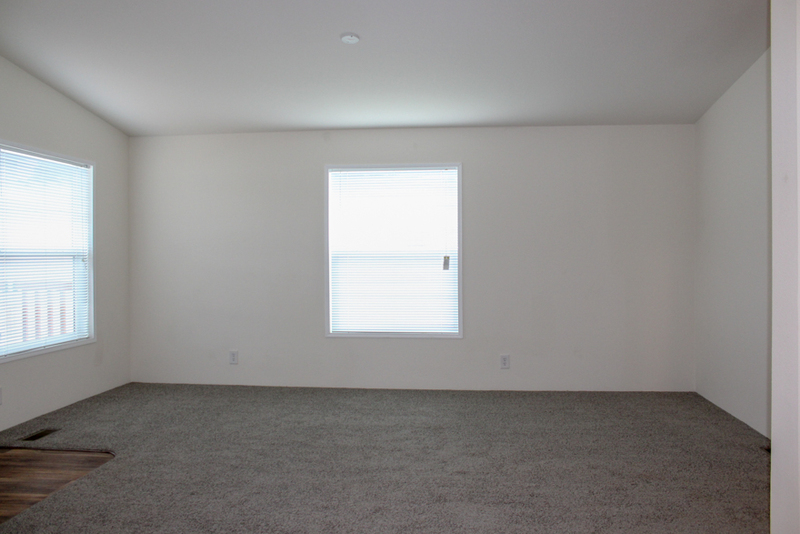 The carpet color is Mantra-Rock Ridge and the walls are painted Creamy White. 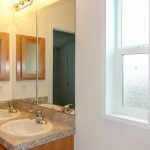 The mini blind on the window us optional. 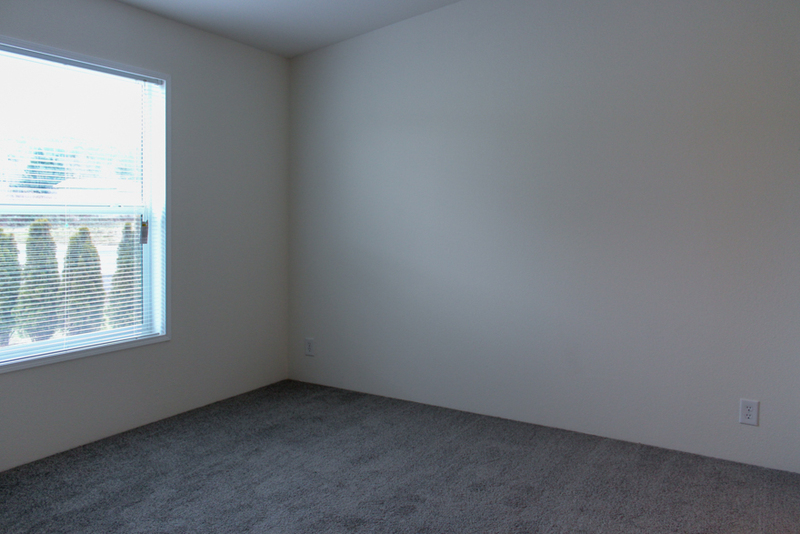 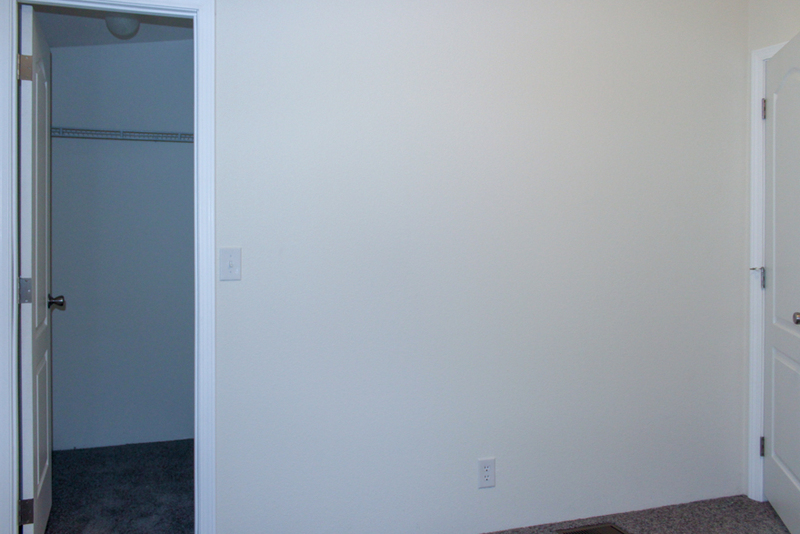 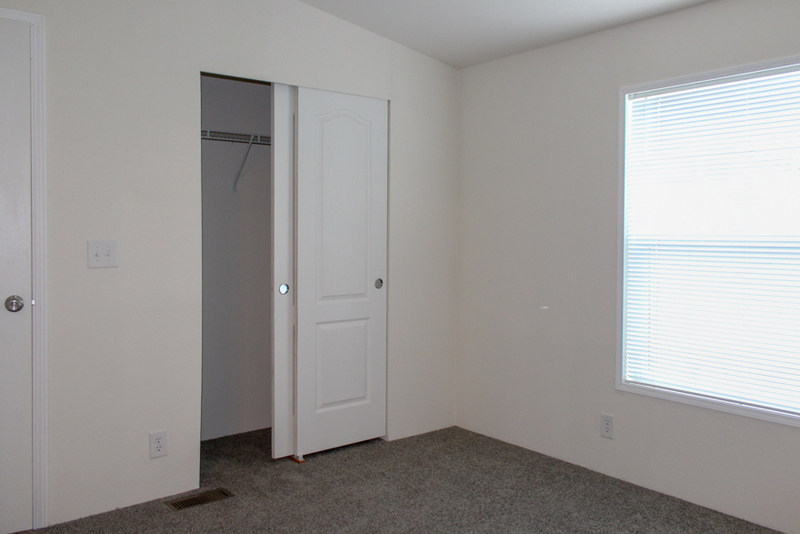 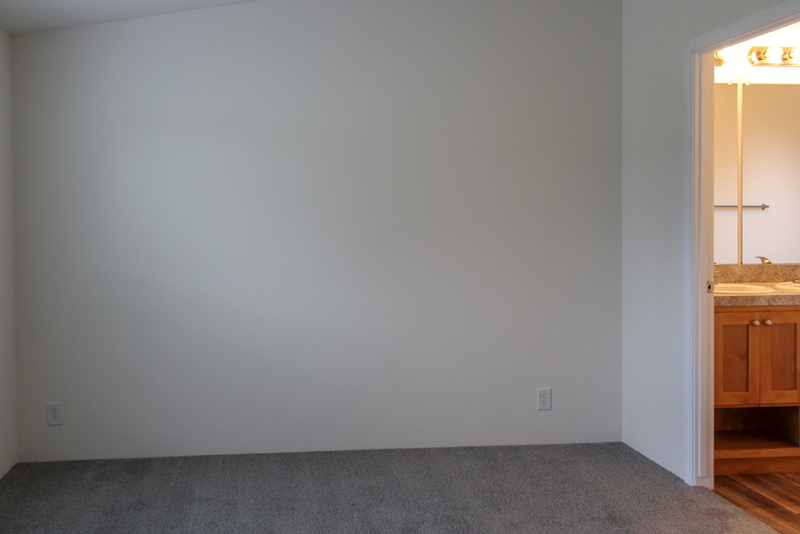 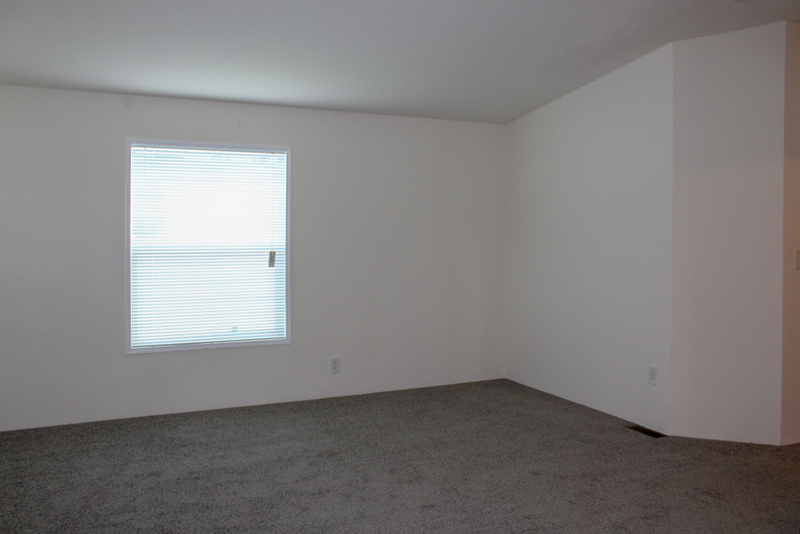 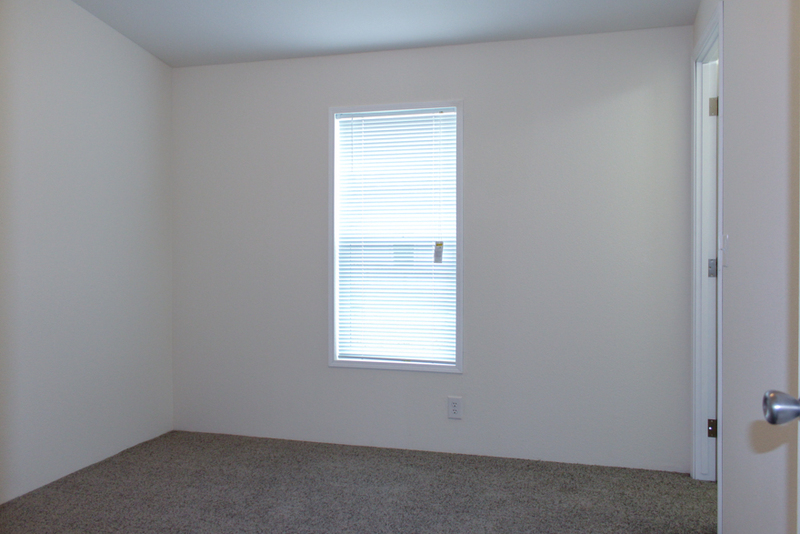 The master bedroom includes a closet with sliding wardrobe doors and a nice size window. 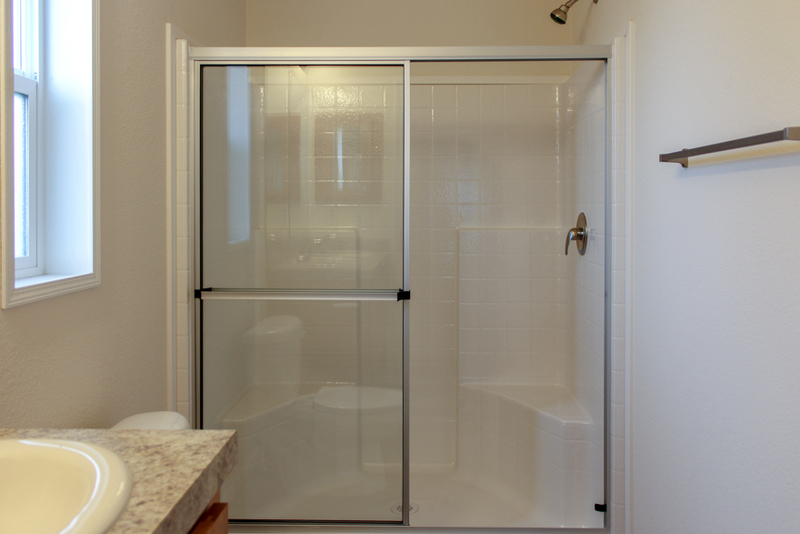 The mini blind is optional. 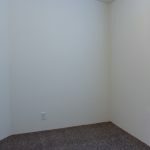 The carpet color is Mantra-Rock Ridge and the walls are painted Creamy White. 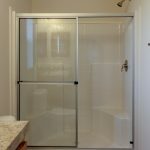 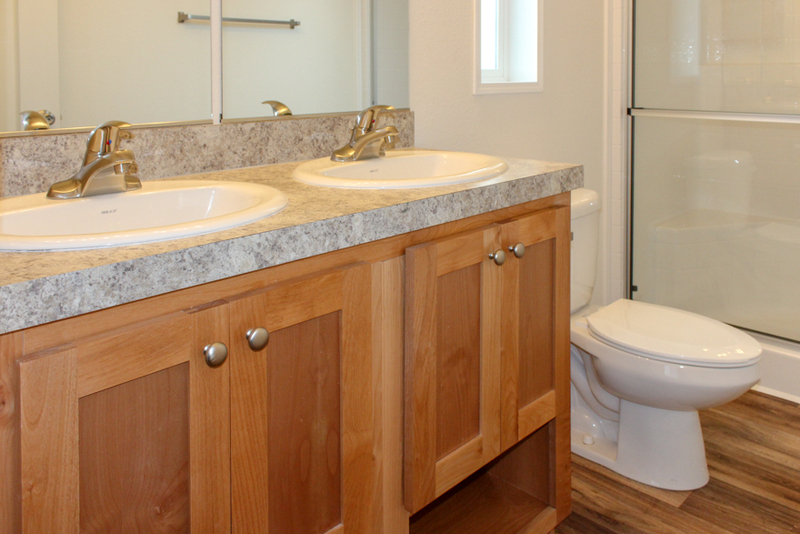 The master bathroom is showing the Easy Upgrade Master Bathroom Package #2, which includes a 60″ walk in shower, elongated toilet, china sink, single lever facuet, and mirrored medicine cabinet. 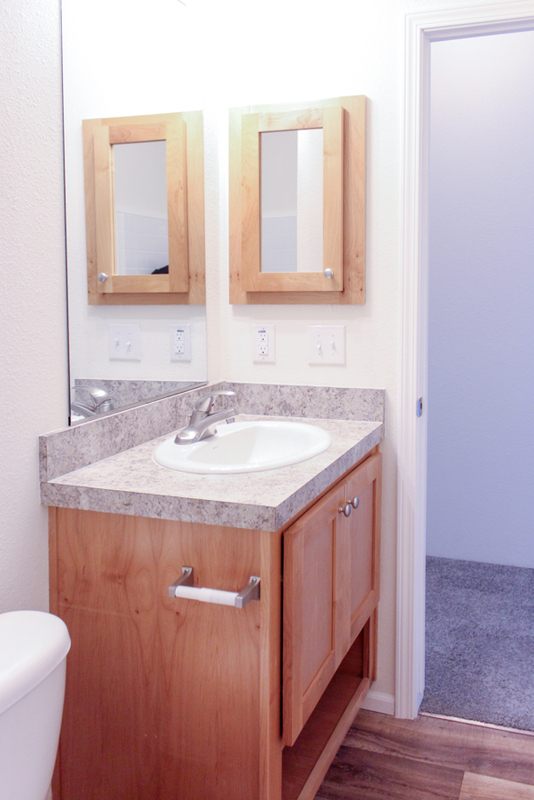 This bathroom is also showing the optional 2nd sink. 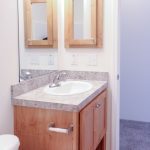 The flooring color is Lime Oak, the walls are painted Creamy White, and countertop color is Belmonte Granite, and the cabinet is the upgrade Shaker Alder. 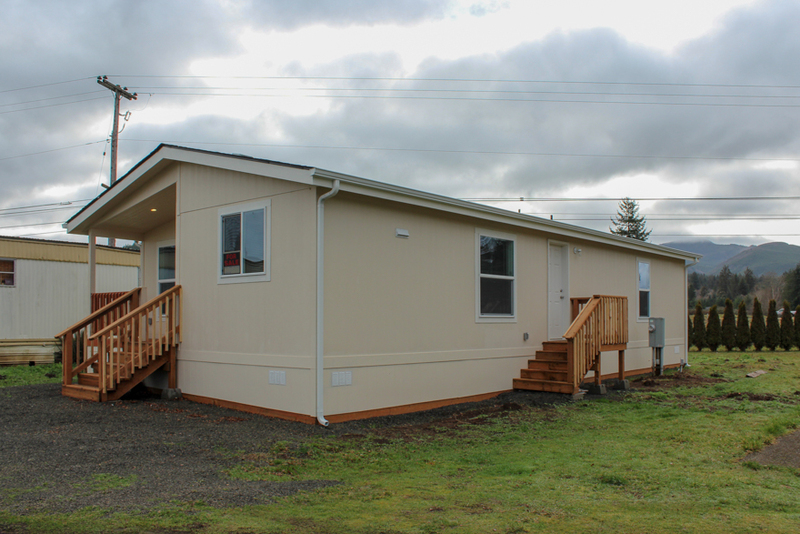 Ask your housing consultant about the other great features that come standard on the Oakridge manufactured home.